The other day I made a bowl of guacamole but forgot to buy tortilla chips. So, I had to make something to dip. Grissini is an easy and delicious choice. What makes it taste great is using high quality olive oil. Mix 2 g fresh yeast in 1 dl milk with a teaspoon sugar. Add the mixture to 400 g white flour. Add 1 dl olive oil, 1 dl water and a tablespoon salt. Mix it well and let it grow to double. Cover the dough with a wet tea towel and let it grow for about 1-2 hours (until it gets double-sized). Roll about 15 cm long, 0.5 cm thick sticks of it. Place them on a baking tray. After 10 minutes turn the oven on and bake the sticks for about 15 minutes at 190 ºC - or until they get golden brown. Optionally, you can use seeds (for example sesame seeds or Nigella sativa) either in the dough or as topping. 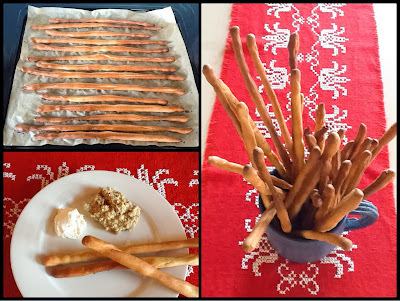 Grissini is also great to hummus, cheese or vegetable dips and creamed soups. Posted in Bread, Snack. Tags: grissini, guacamole, olive oil on 10/02/2014 by Maagedeli.